Discussion in 'Handguns' started by LAZY EYED SNIPER, Apr 23, 2011. It was my wife's EDC for the last couple years until she "stole" my LCP. 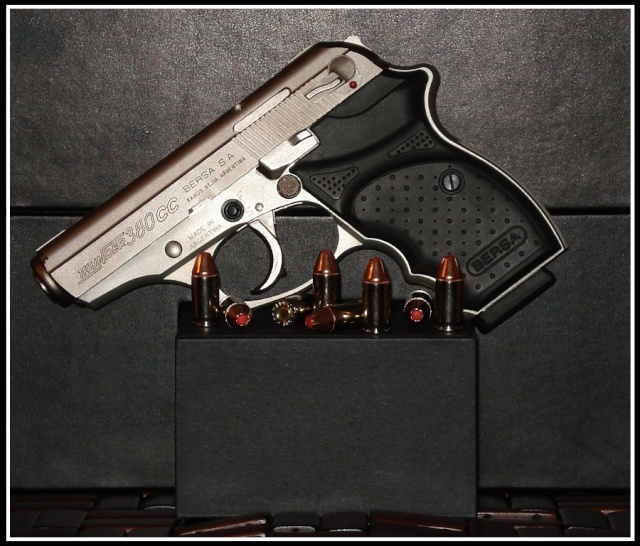 It's a great little pistol and surprisingly accurate for its diminutive size. I love the brushed nickel finish. 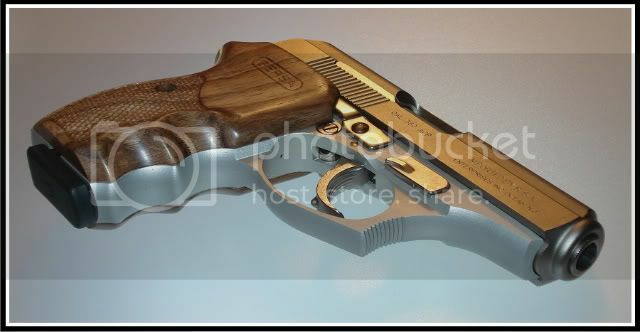 Not a bad all around pistol and a great price at around $300. You can usually find the standard models for around $250-$279. I liked the CC for the more compact and contoured shape. Even though they're smaller, the CC models actually have an eight round mag vs the standard model's seven rounders. 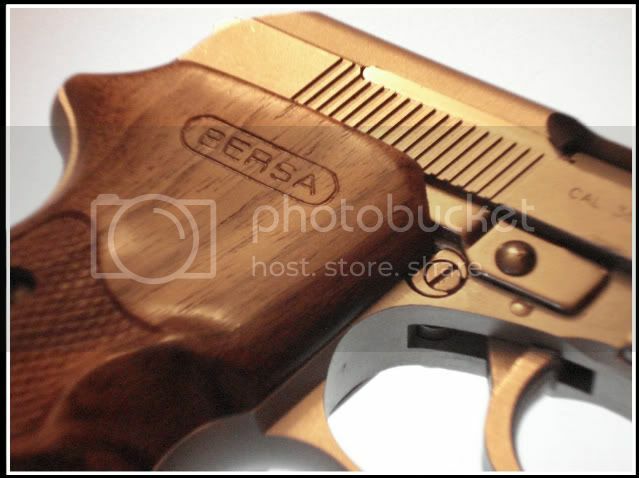 The Compact versions of the Bersa Thunder full size handguns were introduced at the end of the 1990s. 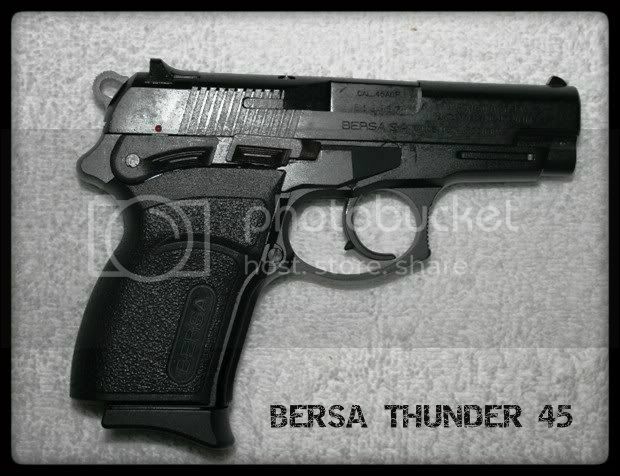 Initially the name was "Mini Thunder" later changed to "Thunder Ultra Compact". Avalilable chamberings are 9 mm Parabellum, .40 S&W and .45 ACP. The .45 version is not available in a full size. 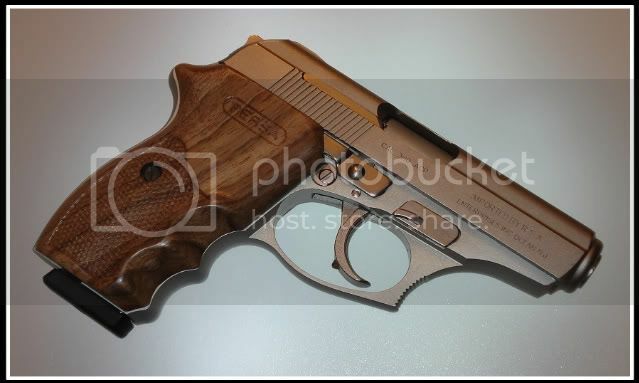 Barrel length is reduced to 3.5 inches (3.6 for the .45 ACP caliber). The Thunder Ultra Compact features a security key to activate a security locking system located on the left side of the frame under the take down lever, in the locked position the hammer cannot be cocked, the trigger won't work in double action, the slide won't cycle and the gun cannot be disassembled. Each pistol has an individual key. When I had to give up shooting my Glock double stack 9mm's due to extensive non repairable damage to my right hand, all I had was my Glock 42 and I wanted another .380, but wanted the most "Glock-like" gun I could find. As far as accuracy and reliability it certainly was Glock-like. She would eat absolutely anything you fed her with nary a hiccup. The finish/quality of the internal parts was definitely not up to Glock standards, but the darned thing worked fine. Noticeably larger than my Glock 42, she became "Big Bertha" which is Bersa with a lisp. She was most comfortable in the hands, and no Glock knuckle when I shot her either. The 3.5 lb trigger pull took some getting used to with inadvertent double taps if I shot her after shooting my Glock. HOWEVER, take down for cleaning and then the reassembly was horrendous and impossible for me to do. My long suffering husband absolutely hated it (loudly) every time I wanted to clean the gun. And my hands became progressively weaker, to the point where I almost could not get the gun to slide lock using my Handi Racker. Stiff slide, it was. Finally, after purchasing one more G42 and two SIG P238's I decided it was time for Bertha to be traded for something else, so I wound up trading her in when I got a Shield .380 EZ. Do I miss her? Yes, I do. 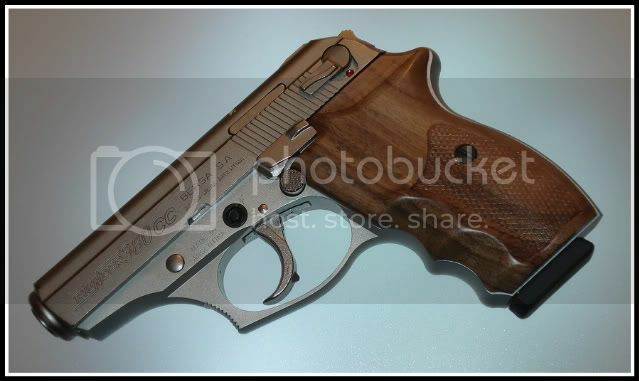 But the EZ is a good gun, if not quite as "Glock like" as Bertha was even though it is much easier to take down. Not too easy to put back together when you have extremely limited hand strength. Interesting fact: The Shield EZ (and also my M&P .22 compact) fits the two holsters I had for Bertha, one Kydex and one leather, so no additional expense involved there.